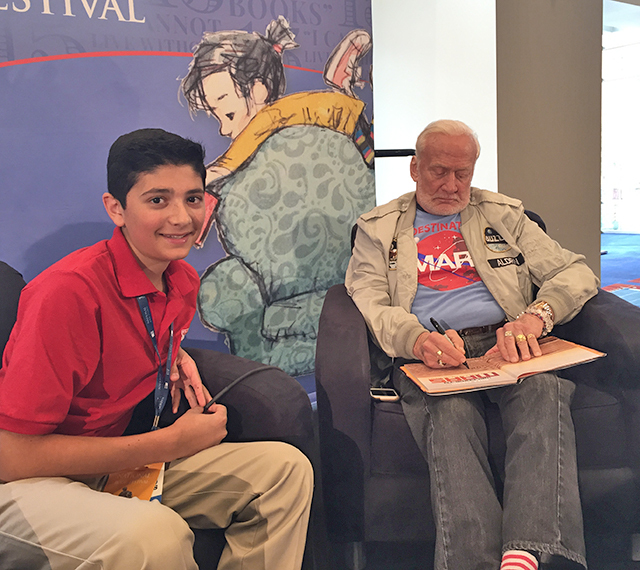 Buzz and Me | Kid Reporters' Notebook | Scholastic Inc.
Gabriel Ferris with Buzz Aldrin at the National Book Festival in Washington, D.C.
On September 5, I had the honor of interviewing Buzz Aldrin at the National Book Festival in Washington D.C. Aldrin and fellow astronaut Neil Armstrong made history on July 20, 1969, when they become the first humans ever to set foot on the Moon. Millions of people watched in wonder as NASA (the National Aeronautics and Space Administration) achieved a goal that President John F. Kennedy had set more than eight years earlier. Let me explain how I was able to sit down with Buzz, as he told me to call him. (His childhood nickname is now his legal name.) A few months ago, I learned that the Library of Congress would recognize me at the book festival for winning a national letter-writing contest. “Absolutely,” I thought! I would be willing to miss my own event to interview the former astronaut. When Buzz entered West Point, he knew that he wanted to follow in his father’s footsteps and become an aviator. In the early 1950s, Buzz served as a fighter pilot in the Korean War. I asked Buzz about his mission to the Moon. Then we talked about his new book, Welcome to Mars: Making a Home on the Red Planet. Recognizing that today’s generation could be the first to go to Mars, Buzz wrote the book, he said, to inspire kids to become interested in space exploration. “Is it realistic to put humans on Mars?” I asked. “I certainly hope so,” Buzz replied. When I asked if he would go to Mars, I expected a loud “yes!” Instead, his answer surprised me. If Buzz were 12, he probably would sign up for a one-way excursion to the Red Planet. Now, he’s not so sure. Still, at age 85, he remains optimistic, curious, and incredibly smart. Watch a clip from Gabriel’s interview with Buzz Aldrin.